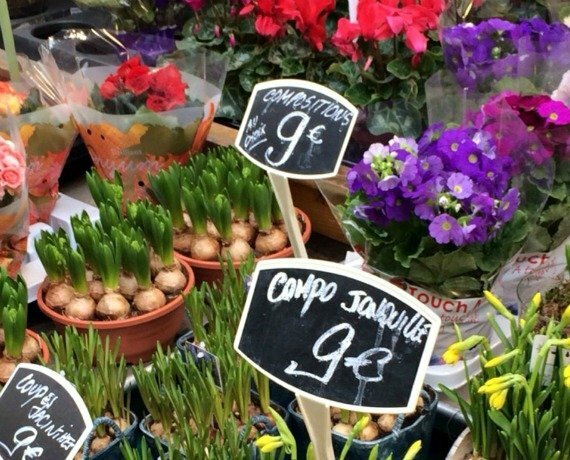 A morning stroll through the Marché d’Aligre in the 12th arrondissement reminded me that spring is approaching. Perhaps not fast enough, but the presence of the bright yellow mimosa in the flower stalls told me that we are nearing the end of the winter season. Soon the cafés will be pulling out their chairs to the sidewalks and the days will lengthen and move us into a beautiful Parisian spring. In the meantime, I’m enjoying all the signs that sunnier days are close at hand, as witnessed by the bursts of color at the flower vendors. 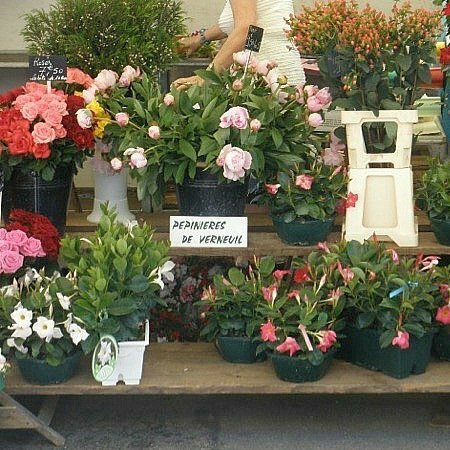 Nothing makes you feel like a real Parisian in your Paris Perfect apartment than selecting a gorgeous bouquet from your local flower market. There are a couple of lovely shops on rue Cler in the 7th arrondissement that I just love, but you’ll find them in every Paris neighborhood, oftentimes with beautiful displays spilling out into the street. Don’t offer chrysanthemums; these flowers are only used to decorate tombs. Red carnations are also not to be given as a gift. They send a message of ill will. Red roses may be given, but only if you are in love with the person to whom you are offering the roses. No all-yellow-flower bouquets. This implies unfaithfulness. In general, avoid an all-white bouquet as these are only used for weddings. When buying flowers, be sure to tell the florist that they are for a gift. Say “pour offrir.” They will be beautifully arranged, with added foliage and sprays of babies’ breath, then wrapped in tissue paper with a cellophane protective covering. The florist’s label will be proudly affixed with a satin ribbon. 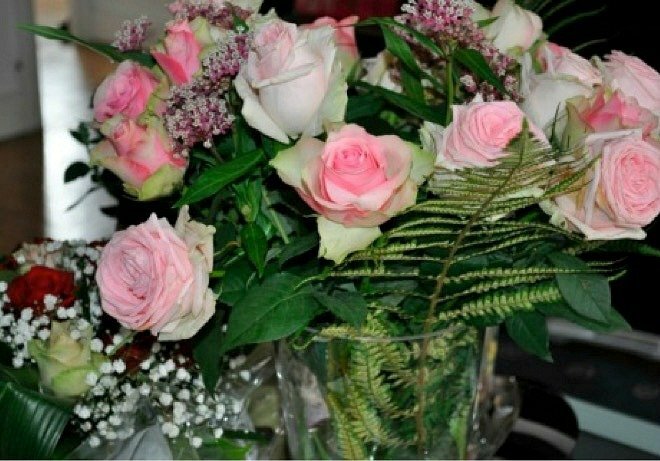 If you are invited to a rather posh event, have the flowers delivered the morning of the party so the hostess has time to arrange them in a vase. Florists are especially busy on Sunday mornings, as families pick up bouquets to bring to the grandparents’ house for the traditional Sunday lunch. 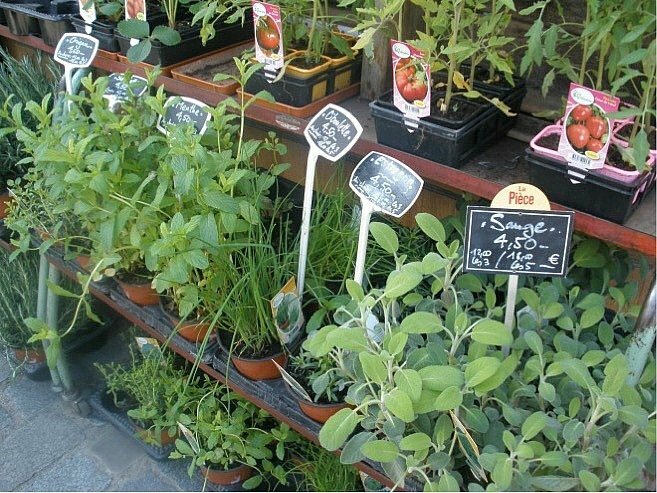 You’ll also find fragrant herbs at the flower stalls in the open air markets. I like to pick up a pot of basil to cut up for my platter of sliced tomatoes. Much fresher than buying basil in the supermarket. 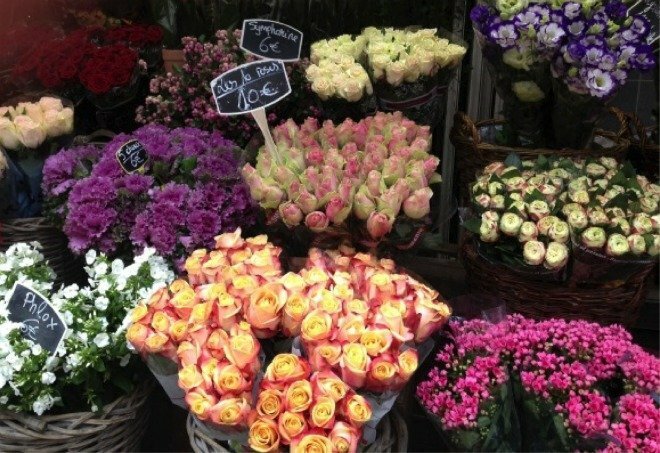 Rose fans (like myself) head to Au Nom de la Rose, a shop that sells only roses, with several locations in Paris. You can tell you are near the shop because of the rose petals that adorn the sidewalk in front of the door. They also throw a handful of loose petals into the bag when you purchase a bouquet. So pretty and fragrant! Shelby Ocana is Californian by birth and Parisian by choice. She arrived in the City of Light for a six-month stay when she was 20 and three decades later she is still there, working in the field of study abroad and raising two bilingual, bicultural children. Paris is her favorite subject to write about. Even after living there for so many years, Shelby continues to find one new thing in the cityscape each and every day that thrills her heart and amazes her eyes. PREVIOUS: Share Your Love Story to Win a Free Stay 5 Night Stay! Posted on Tuesday, February 10th, 2015 at 7:24 am in Parisian Living. You can follow any responses to this entry through the RSS 2.0 feed. You can leave a response, or trackback from your own site. 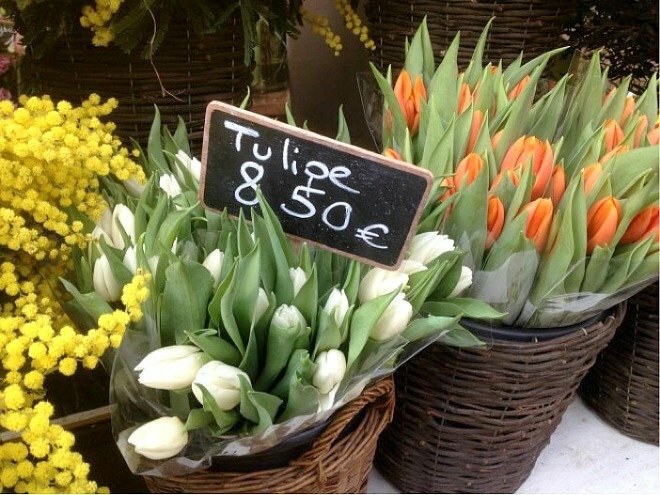 Welcoming Spring in Paris 6 Gorgeous Mid-Winter Flowers to Buy in Paris 7 French Christmas Traditions to Adopt Paris in Bloom: A Stunning Floral Tour of the City! I so enjoyed your article! We are visiting in December and I am trying to recall the area where we walked by blocks of flowers, almost like a flower district, a few years ago. I’m getting conflicting ideas from friends who are helping me remember! That’s probably right by Notre Dame on Ile de la Cite.